Harajuku girl in a sheer top with denim shorts, panda platforms, and a cute pink hairstyle. Harajuku girl with a kawaii Harajuku style featuring pink streaked hair, lace suspenders, a pleated skirt, tube socks, and platform creepers. 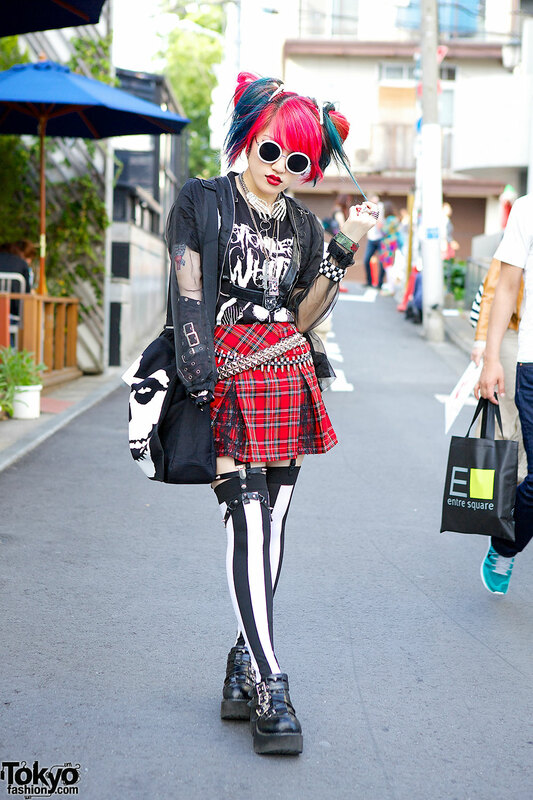 Lisa 13 in Harajuku with pink and blue hair in band tee, plaid skirt and striped socks, with rock accessories. Members of the J-Pop girl group Glad Game in Harajuku wearing items from the Japanese fashion brands Galstar, Gilfy & Ghost of Harlem.